In his narcotic cabaret song “Make Up” from his glam opus Transformer, Lou Reed details, in his quintessentially monotone deadpan, the process of creating a look. From eyeliner to lip gloss, Reed runs down a recipe-like list of the necessary drug store-purchased parts needed to perform–at least that night’s–femme identity. With the repeated refrain “Now we’re coming out, out of our closets,” Reed seems to refer to drag queens as he frequently does in songs like “Candy Says” and “Walk On The Wild Side.” But taking a wider perspective, “Make Up,” overall, explores the collage of materials and cosmetics that go into constructing femininity. 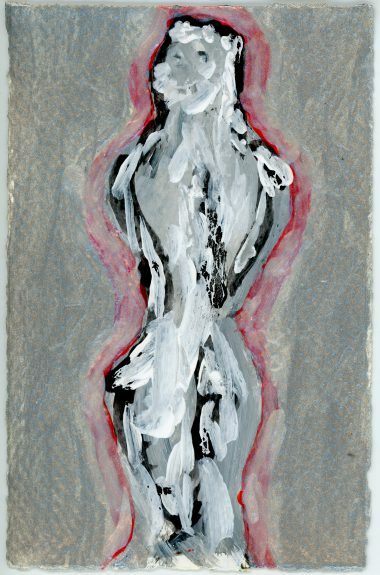 A similar examination of the disparate parts of the feminine can be viewed in Vaginal Davis and Louise Nevelson’s current two-person show Chimera at INVISIBLE-EXPORTS. At first glance, Nevelson and Davis seem like odd bedfellows. Other than guests at a dream dinner party, what could a canonized 20th century sculptress and a heroically subversive “drag terrorist” who emerged from the homo-core scene in Los Angeles with her zine Fertile Latoyah Jackson have in common? A lot, as Chimera masterfully reveals. According to Merriam-Webster, chimera can be defined as “an imaginary monster compounded of incongruous parts.” It’s no mistake, then, that the exhibition takes Chimera as its namesake for both Nevelson and Davis use a combination of uncommon and unlikely materials in their work. 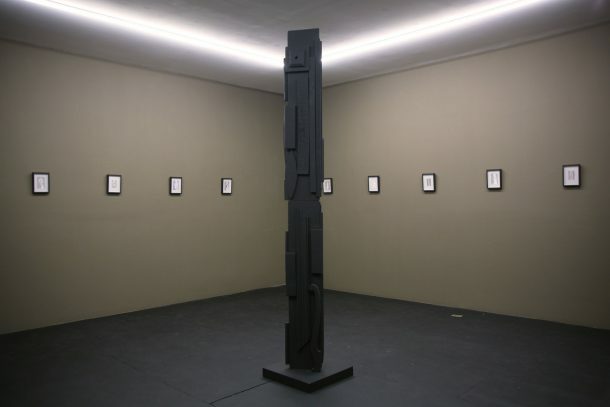 The exhibition centers around Nevelson’s giant vertical black 1959 sculpture Colonne II, which merges found pieces of wood into a pillar. Beginning her career at the height of Abstract Expressionism, Nevelson presented a challenge to its hypermasculinity by making similarly monumental art culled from, well, trash. Refusing and competing with the grandeur of the canvas, her works like Colonne II feature discarded pieces of wood discovered on the New York City streets, resembling random bits and pieces of furniture. Calling herself the “original recycler,” Nevelson’s garbage-picking impulse and magpie-like collection of her findings not only echoes the skyscraper-filled urban environment in which she lived, but also mimics the construction of the self through an amalgamation of odds and ends, experiences and events. 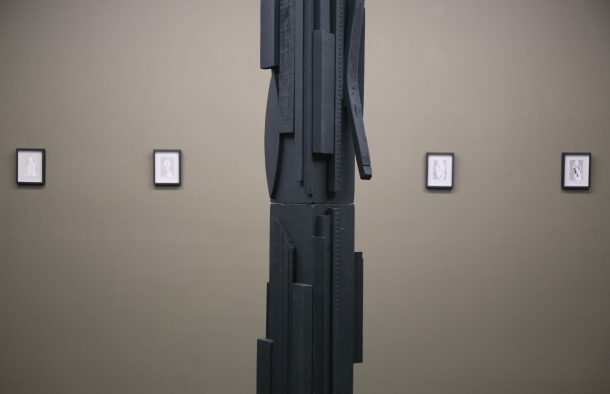 While Vaginal Davis once stated she’s not “a sculptress like Louise Nevelson,” her use of unexpected materials presents a rich formal comparison. 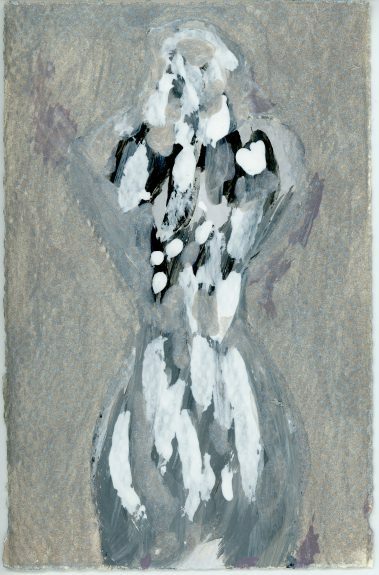 Surrounding Nevelson’s Colonne II are twenty of Davis’s small, playing card-sized make-up paintings. Titled after a wide range of (largely women of color) Hollywood stars, b-movie vixens, singers and other performers from demented Russ Meyer divas Tura Satana and Kitten Natividad to the perhaps more respectable but no less role model-worthy, Dorothy Dandridge, Ruby Dee and Miyoshi Umeki, Davis’s paintings are derived from materials found at a cosmetics counter rather than an art supply store. She uses witch hazel, mascara and eyeliner, as well as recognizable brands like Afro Sheen hair conditioner and Jean Nate perfume, to create almost abstract, ghostly yet curvacious figures in a palate that resembles the slick sheen of pale purple, pink and iridescent cream found at the bottom of a makeup bag. Apparently, Davis’s employment of cheaply functional materials doesn’t come from nowhere. She recalls in an interview with Dazed Magazine: “My mother made me toys out of trash, strange creature-like dolls.” Like her mother’s dolls, Davis transforms these starlets and pioneering role models into strange creatures, using the materials of their own glitz and glam-creation: hair and makeup. Even though each work is titled after a singular figure, the actual works have seemingly little in common with the performers themselves. Gone is Tura’s eponymous winged black eyeliner seen throughout her turn as the badass Varla in Faster Pussycat! Kill! Kill! ; here it’s gestured to subtly with some black smudges in the body of the figure. Only the exaggerated hourglass figure of Kitten Natividad, known for her 44-inch chest, belies her real physical form in her portrait. Instead, Davis’s silhouetted figures seem like hybrid creations, constructed out of a Sephora’s worth of makeup and hair products. This reference to hybridity and construction of identities made of disparate parts echoes, in some respects, that of the artists. As José Esteban Muñoz writes in the introduction of Disidentifications: “It is no coincidence that the cultural workers who produce these texts all identify as subjects whose experience of identity is fractured and split. The type of fragmentation they share is something more than the general sense of postmodern fragmentation and decenteredness…Hybrid catches the fragmentary subject formation of people whose identities traverse different race, sexuality and gender identifications.” (31-2). Davis, too, constructed her own persona, referring, in the gallery’s press release, to being “hatched” in Los Angeles. Muñoz in his chapter “The White To Be Angry” in Disidentifications, charts Davis’s personal myth-making: “According to Davis’s own self-generated legend, her existence is the result of an illicit encounter between her then forty-five-year-old African American mother and her father who was, at the time, a twenty-one-year-old Mexican-American. Davis has often reported that her parents only met once, when she was conceived under a table during a Ray Charles concert at the Hollywood Palladium in the early 1960s” (95). Relating to the Black militant activism of the 1960s and 1970s, Davis formed her own radical punk persona, taking a name partially derived from revolutionary Angela Davis. Like her adoration of Angela Davis, Davis explains, in an interview with Ryann Donnelly in Art In America, “My paintings are kind of a feminine totem style. 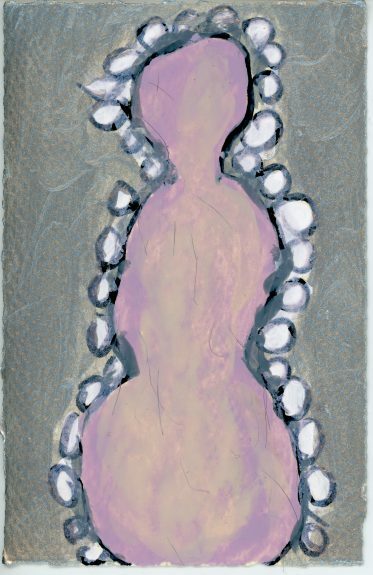 It’s all about female imagery, and female worship.” Not only reflecting the cobbled-together identity of chimera, the works in the exhibition also seem to resemble mythological or religious artifacts, from Nevelson’s totem-like sculpture to Davis’ paintings. The makeup paintings both mirror the verticality of Colonne II and resemble Byzantine icons in their size and golden tint. Both artists seem to put hybrid feminine creation–whether the creation of a look, a performance of identity or an artwork–on a pedestal as an idol to be worshipped. Tags: Chimera, Disidentifications, femme, hybrid, hybrid identity, Invisible-Exports, Jose Esteban Munoz, Louise Nevelson, Vaginal Davis. Bookmark the permalink.